The first wine made exclusively for Disney Parks was unveiled at this year's Epcot International Food & Wine Festival- I had a chance to sample it, and think it's a fabulous wedding reception pairing. 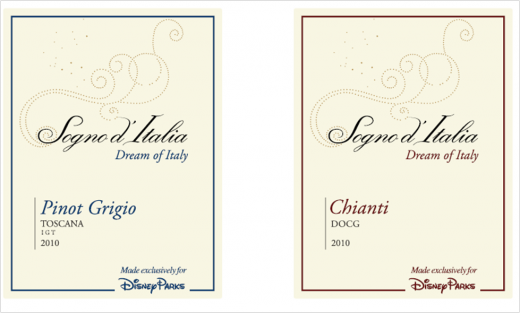 Sogno d'Italia (Dream of Italy) is produced by Placido in Tuscany and imported by Banfi Vintners. It can be found in a yummy Chianti and Pinot Grigio. Chianti - A pleasantly soft and round red wine with a note of cherries and plums, accented by hints of spice. Eminently drinkable it is a red wine with a bright fruit character. It is ideal with red-sauced pasta dishes, roasted or grilled meats and aged cheeses. Pinot Grigio - A fresh and crisp white wine infused with the flavors of pears and white flowers. 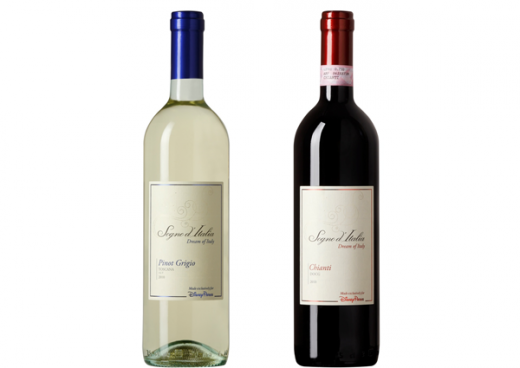 The wine has a fragrant bouquet and crisp freshness with succulent fruit flavors and a lingering finish. This light white wine is a perfect complement to cream-sauced pastas, fish or chicken dishes and antipasto.